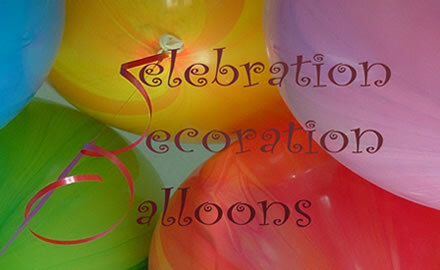 Celebration Decoration Balloons in Bognor Regis, Middleton on Sea and Littlehampton: Party Balloons for all your celebrations in Worthing, Portsmouth, Brighton, Littlehampton, Chichester and across West Sussex. "Every Occasion Is A Celebration" "Balloons transform your venue with colour and fun"
We provide balloon decorations and sculptures for weddings, birthdays, anniversary parties and corporate functions, in fact for just about every occasion, including wakes. We can make your celebratory event extra special with superb selections of fantastic patterned balloons in many exotic colours and a wide variety of different shapes and compositions. "Our marquee took on a new look when you decorated it with your beautiful balloons. Thank you so much." We offer a friendly, personal and professional service, working closely with themes, colour schemes and your chosen venue. Let us impress your friends and relatives with decor that is more often seen only at corporate or VIP events. We can decorate as little or as much as you wish. Every occasion is a celebration. and our beautiful balloons can give just as much pleasure as a bouquet of flowers. We can send just one glorious balloon in a lovely box, a bunch of fun balloons, or a bouquet of pretty balloons - the choice is yours. "I want to tell you how much my sister loved her bouquet of birthday balloons." 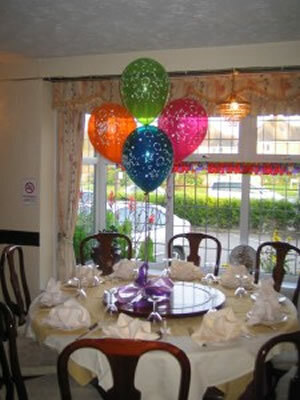 Read more about Celebration Decoration Balloons . . . .